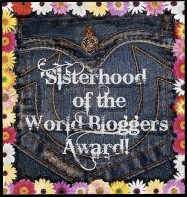 Sisterhood of The World Bloggers Award !! Thank you Inside a Dog’s Heart for nominating me to the sisterhood of the World of Bloggers. I am deeply honored. I would also like to congratulate you on your Award !!! To “accept” this award, you have to thank the person who nominated you. Then you answer the questions I’ve written for you, and pass along your own set of questions to your own nominees. you should choose 5-11 questions to ask your nominees. And choose 5-11 nominees to pass this award on to. Well 4 days into the New Year… hope everyone is having a good start to 2015. It has been a bit busy for me. The Best Western has been packed with skiers and visitors and we have all been putting in long hours, including working the holidays. Unfortunately a lot of the staff and guests have been sick so I too caught some of that and now get 2 days to rest up!! Today we took the tree and Christmas decorations down and put the house back in order. I think I am back on track and can hopefully get back to some blog posting :-). Now it is time to relax so I can get better fast. I don’t normally get sick so hopefully I can spring back quickly!! We got about 5 inches of snow over the last 2 days and are now expecting a stronger storm to start up tonight going through tomorrow and into Tuesday for about 8 or more inches… We will probably have at least a total of 13 inches or so here in the valley and a lot more up in the mountains and on the passes!! It is definitely winter in Montana! !